When Pete Mastellone left the University of Miami with his B.A. degree he left behind a career which gained him All-American honorable status. Pete, co-captain of the 1950 Hurricanes, started and ended his career as an offensive fullback, however, almost every minute of his actual playing time was spent on defense. His proficiency at his position helped the Hurricanes to a 9-0-1 season and a birth in the 1951 Orange Bowl Classic. Mastellone excelled at mixing up the defenses, which came easy for him, and he intercepted 6 passes in his career. Ironically Pete ended his career as a fullback, carried the ball four times for eleven yards and was credited with Miami's 154th first down of the season, a fitting end to a great career. Former teammate and UM Hall of Farmer, Stitch Vari, summed it up by saying, "Pete is most deserving of this honor, he was a great one". Pete passed away peacefully in the presence of his loved ones at VNA Hospice House on Sunday, August 14. Pete was born on November 12, 1929, in Hillside, NJ, the son of Anthony and Rose Callandrillo Mastellone. He grew up in Hillside, NJ, with his sisters Marie, Peggy, Lindy and brother Ray. He graduated from Hillside High School in 1948, where he excelled in track and field, baseball and football. While in high school he briefly played professional baseball, but returned to finish his exams. He was recruited to play football for University of Miami. 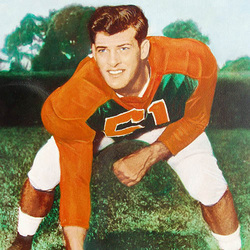 His career at University of Miami, from 1948-1951 gained him All-American honorable status and, co-captain of the 1950 Hurricanes. Although he started and ended his career as an offensive fullback, he spent considerable time as a defensive linebacker. He helped the Hurricanes to a 9-0-1 season and a berth in the 1951 Orange Bowl Classic. His picture on the cover of the 1951 Orange Bowl program is memorialized on the wall of the old Orange Bowl Stadium, now known as the Marlin’s Stadium. While at University of Miami, he met Connie, his beloved wife of 64 years. After graduation in 1952, he was drafted by the Philadelphia Eagles. Just hours before reporting to the Eagles training camp, he was drafted into the Air Force during the Korean War. Pete served in the Office of Special Investigations and played on the Air Force football team for two years. Upon discharge from the Air Force he reported back to the Eagles training camp. He played four preseason games and decided to retire from football to spend time with his family. He had two simultaneous careers, he was a firefighter for the City of Miami Beach where he retired as a Lieutenant after 28 years. The second career was working side by side with his wife Connie in Real Estate. During these years his daughter Pam, son Peter, son James, and daughter Jeanne were born. Pete and Connie retired to Vero Beach in 1983, the same year he was inducted into the University of Miami Sports Hall of Fame. Pete loved to play golf with his friends at the Vero Beach Moorings Club, carve wood, and oil paint. One of his paintings can be seen hanging in the Navy Seal Museum, in Ft. Pierce. Pete will be remembered as a quiet and gentle man who was devoted to his family and an avid sports fan. He could usually be found sitting behind home plate at the baseball field or in a gymnasium cheering gymnastics and volleyball, as he loved his sports-minded grandchildren. He is survived by his loving wife Connie, his children Pam, Peter, James, his wife Ceri; Jeanne, her husband Lev; his grandchildren Jamie, Allison, Marcus, Rachel Ann and Zachary.